Stir-frying is a technique every home cook should master for easy, weeknight meals. The super-fast cooking time means that vegetables are crisp-tender instead of mushy, and they're endlessly customizable to fit your tastes. This recipe pairs flavorful chicken thighs with carrots and broccoli florets, cooked in a savory sauce made up of soy sauce, stock, sesame oil and spicy sriracha. If you like, sprinkle the finished stir-fry with chopped green onions, cilantro leaves or crushed peanuts for added texture and brightness. This stir-fry would also be delicious with snow peas—simply stir them in with the rest of the vegetables. 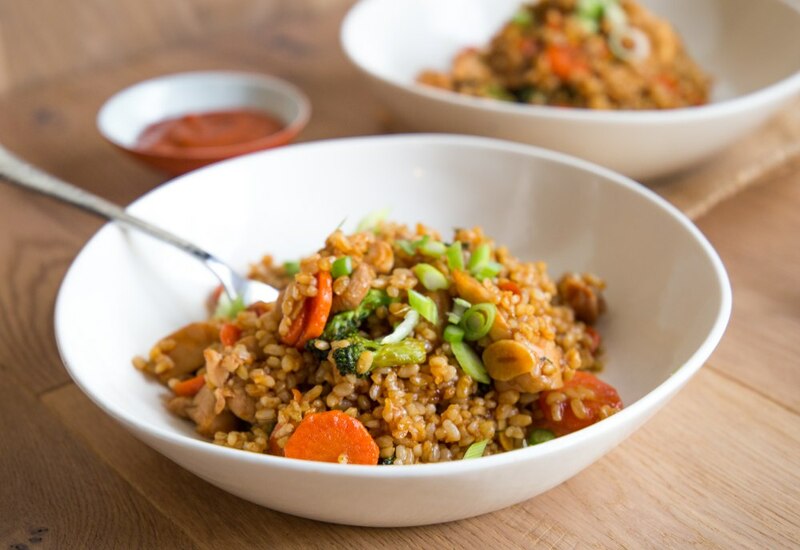 To keep this recipe low in carbohydrates, serve the stir-fry with cauliflower rice instead of brown rice. Vegetarian? Use vegetable broth and replace the chicken with cubed tofu. You can also find vegetarian oyster sauce made from mushrooms at Asian grocery stores or online. Per Serving: 409 calories; 13g fat; 53.4g carbohydrates; 21g protein; 68mg cholesterol; 784mg sodium. This has got to be the tastiest and quickest stir-fry on the planet! The sauce was so delicious and the sriracha added a little kick to it. This is perfect for those nights when I'm craving take-out but want something healthy, quick and easy. Definitely a winner! This chicken and broccoli stir fry was incredible. I love the sriracha! I added a little extra, like I always do. This was incredibly simple and easy. Perfect for weeknights and much better than even the best take-out. I didn't have oyster sauce on hand so I used soy sauce. Excellent. Nice little spice. Super easy. One pot, minimal dishes. Just so good. Chicken and broccoli stir fry is delicious, but I used day old white rice instead of brown rice. I also used two garlic cloves instead of three and didn't use oyster sauce. This is definitely on my weekly rotation. I opted for cauliflower instead of brown rice, such a good idea. I love having options when it comes to stir-fry.